Finally, we can communicate with computers in the same way we interact with each other – through natural language voice and chat inputs that shift responsibility for learning the interface from humans to machines. We’re honored to be recognized as a Strong Performer in “The Forrester New Wave™: Conversational Computing Platforms, Q2 2018”. The report identifies the most significant providers, evaluating Nuance along with Amazon, Google, Microsoft and IBM on current offering, strategy and market presence. 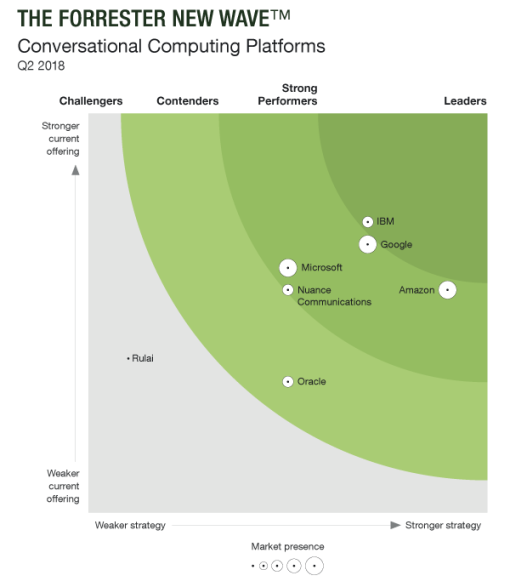 Download Conversational Computing: The Next Paradigm for Human-Machine Interaction featuring “The Forrester New Wave™: Conversational Computing Platforms, Q2 2018” for Forrester’s take on how to choose the right partner for your conversational computing needs – and the challenges Nuance is uniquely positioned to address.